These properties are prefect for those looking to get away either for a planned honeymoon, anniversary, or a quick romantic getaway for the weekend, just for you and someone special. These properties are perfect for any type of groups looking to stay close to each other. Call for exact details and locations! 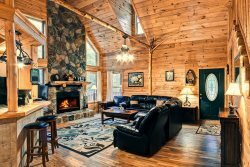 These properties offer year-round or seasonal mountain views. These properties are prefect for those looking to be by a lake, creek or river. You have easy access to fishing, tubing and playing in the water or just relaxing by the water. These properties have all the space you need and many of them have extra game rooms, pool tables and more for all the family fun you would want. Many of them are also pet friendly. These properties are prefect for those wanting to bring their pets with them. Ask your friendly agent about weight and size restrictions.